Watch the “EARTHA” video now. 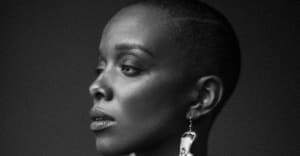 Jamila Woods has shared a video for her single "EARTHA." The video features appearances from Pose star Indya Moore and Langston Kerman of Insecure. Check it out above. In a statement released alongside the video, director Fatimah Asghar explained her thinking behind the video. "'EARTHA' pays homage to Eartha Kitt's defiant spirit, and her refusal to compromise in a world that is always trying to constrict women and femmes," she said. "In the production, we wanted to reference iconic images of Eartha Kitt and embody her energy to create a celebration of unapologetic femininity and sisterhood, as well as play on and challenge the ways that women have been historically portrayed in cinema by going for an old-school film vibe. As Eartha taught us, being feminine isn't just one thing-- it's an incredible range. That energy permeates the video." "EARTHA" appears on Woods's upcoming album Legacy! Legacy!, due on May 10. It is her first full-length project since 2016’s HEAVN features guest spots from Saba, theMIND, Nico Segal, Nitty Scott, and more.